Christians are to be followers of Christ and not the followers of culture’s “tolerance.” Christ commands His followers to gently restore those who go astray and often believers who attempt to do this are met with the words, “You can’t judge me!” Is this not a double standard to judge those who are judging? However, many people are right to confront those who judge them unjustly with prejudice. What does it mean to judge someone? The Greek word for judging in the New Testament is krino. This word simply means to determine and discern something. Yes, this is the word that Jesus used when He spoke of judging. Judging is an unavoidable part of life. All of our choices consist of judging. In the New Testament, the apostle Paul spoke of judging where to stay for the winter (Titus 3:12) and Luke mentions the judging done to determine how and where to travel (Acts 20:16; 27:1). Certainly, this kind of judging is fine. What about judging others? There are number of ways to judge others. One can judge another by appearance, by behavior, and judge another unto condemnation. Is this the judging that Jesus judged to be wrong? Therefore you are inexcusable, O man, whoever you are who judge, for in whatever you judge another you condemn yourself; for you who judge practice the same things. But we know that the judgment of God is according to truth against those who practice such things. And do you think this, O man, you who judge those practicing such things, and doing the same, that you will escape the judgment of God? In the end, God is the Judge. In Romans 2, Paul judges by God’s judgment. This is judging that we can do knowing that those who practice evil things will not escape God’s judgment. Those who struggle with certain sins will make no provision for those who sins (Rom 13:13–14). However, crossing those lines into temptation is different for everyone and Christians must respect these positions. Paul commanded, “As for the one who is weak in faith, welcome him, but not to quarrel over opinions” (Rom 14:1). Paul spoke of those who judged others based on their own personal opinions even to judge whether one stood or fell before God based not on the Scriptures but on their opinions. Paul affirmed in Romans 14:4, “Who are you to judge another’s servant? To his own master he stands or falls. Indeed, he will be made to stand, for God is able to make him stand.” Whether one stands or fall is God’s judgment, and yet “we know that the judgment of God is according to truth against those who practice such things” (Rom 2:2). Romans 14:10 says, “But why do you judge your brother? Or why do you show contempt for your brother? For we shall all stand before the judgment seat of Christ.” Let God judge concerning eternity. Why judge if no one can judge? “Happy is he who does not condemn [judge] himself in what he approves” (Rom 14:22). Paul concludes in Romans 14:13, “Therefore let us not judge one another anymore, but rather resolve this, not to put a stumbling block or a cause to fall in our brother’s way.” Therefore, judging by appearance, judging by opinions, and judging unto condemnation is wrong. Many do not even know when they have judged someone else. When you speak against another person, then you are judging them (Jas 4:11–12). Any detest or contempt of another culture, ethnicity, appearance, financial standing, food, drink, festival, or Sabbath (Col 2:16). This is not God’s judgment. Now, when should Christians judge one another? Can we judge the person who is putting one’s soul at risk. That is exactly what Paul did in Romans 2:2 when he judged those who judge hypocritically. Now, we cannot determine someone’s eternal destination on our own, but we can know whether someone continues to sin and thus that person endangers one’s soul. Christians judge one another by what is right and wrong and how each lives. The righteousness of others offends the consciences of many people while evil offends the consciences of others. The actions of the faithful judge the actions of others. Hebrews 11:7 says that Noah’s behavior judged the world. This judging is unavoidable, because righteous living is offensive. Studying the Bible judges those who do not study, and those who do not study the Bible judge that those studying are doing something that really does not matter and is not worth their time. Furthermore, Paul and Barnabas declared that many judge themselves unworthy of salvation because they reject salvation (Acts 13:46). How can anyone do this without judging? How can anyone go to restore without first determining that someone is practicing a sin? They cannot. Christians must judge and do so righteously. Why would this matter that Christians restore someone unless they have judged that their soul is at risk? They must judge. On one such occasion, the apostle Paul said in 1 Corinthians 5:3 that he had “already judged” a man who was openly practicing sin. Paul’s judgment was no sin, because Paul spoke the commands of God to withdraw from Christians who sin (1 Cor 14:37). The apostle Paul taught that the congregation to not associate with such a person. Christians must not judge those on the outside of the church. There is no need to judge the abortionist or the homosexual, but rather Christians seek to bring them to the Truth. How could Paul give this instruction without judging Christians? He could not and yet he did not sin. Add to this that Paul spoke further to the congregation about not taking each other to judgment before unbelievers, but that they should have their own wise men judge on their own matters (1 Cor 6:1–6). Here again, judgment is taught and approved. Why all of this judging? Christians can know that someone’s soul is at risk and that is not the kind of judging that is condemned. Listen again to Jesus. 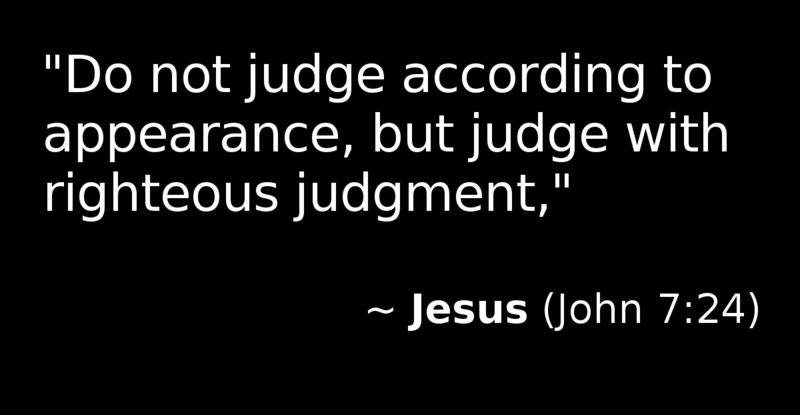 Jesus proclaimed in John 7:24, “Do not judge according to appearance, but judge with righteous judgment.” In this instance, others were judging Jesus by their standards, and yet He did not respond with “You cannot judge me” rather He corrected their standard to be according to righteousness. Jesus commanded His followers to beware of false prophets, and in so doing, He instructed them saying, “Beware of false prophets, who come to you in sheep’s clothing, but inwardly they are ravenous wolves. You will know them by their fruits” (Matt 7:15–16a). Even more, Paul instructed those who listened to him to judge what they were taught (1 Cor 10:15; 11:13, 31; 14:29). Clearly, we can judge righteously and must judge other Christians. Let us judge the behavior of fellow Christians. Let us encourage one another and restore those who fall away in gentleness and humility. Let us not judge with hypocrisy, by appearance, or unto condemnation. Let us not judge those who are outside the church. However, realize that we can judge that someone is practicing a sin and that a person is therefore putting one’s soul at risk. In the end, Jesus professed that those who reject His words will be judged by His words (John 12:47–48). Therefore, let us judge ourselves, so that we may not return to condemnation (1 Cor 11:28–34; 2 Cor 13:5). Next Next post: How Much Have You Been Forgiven? Hello! I do not know how or when I should judge a person’s behavior. If I cannot judge a person, how should I choose my friends? If I see someone rob a bank, shouldn’t I be able to judge his behavior as bad? It is a person’s BEHAVIOR I’m stuck on, don’t know what to think. Hope you can help me! Larry, You can and must judge that action is right or wrong without condemning anyone. Furthermore, Jesus taught that we can judge by righteous judgement (John 7:24). Jesus teaching not to judge is a warning about the measure of judgement (Matt 7:1–2). See the article above. Thank you for this lesson. Many believers are accused of judging when they are actually giving them the word of God. This lesson is very clear on that. Since we know that judgment begins at the household of faith, we as believers should judge one another in the spirit of love. Not for our destruction but for good. 1 Peter 4:17 King James Version (KJV)……17 For the time is come that judgment must begin at the house of God: and if it first begin at us, what shall the end be of them that obey not the gospel of God? Thank you for this very needed article. I appreciate seeing scriptures that explain a very pertinent subject in America today. Many say nothing concerning sins that have become prevalent in our society today, because they are afraid of judging others. May God bless you for explaining when a Christian should not and should make judgments. Thank you, Jo-Ellen. Your words are encouraging. God bless you.